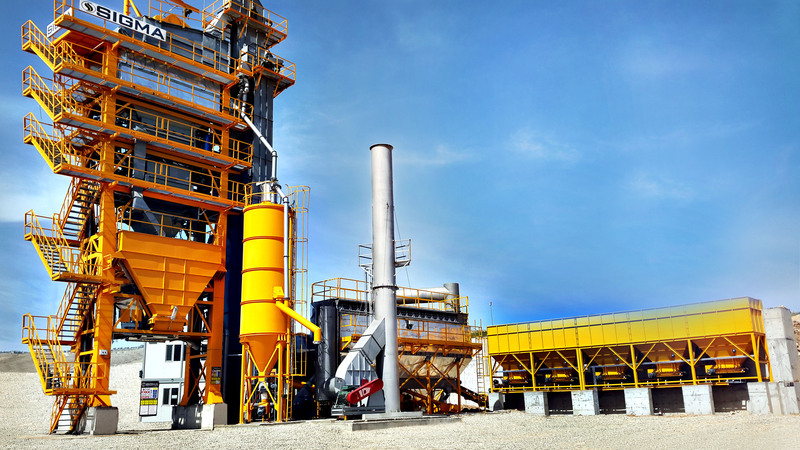 SIGMA supplied and commissioned in early June 2014, a 240 tons/ hour capacity asphalt plant in Arbil city of Northern Iraq. Being shipped from factory in March 2014, the computer controlled fully automatic plant is supplied complete with bitumen tanks and thermal oil heater. The plant is capable of operating with heavy oil (fuel oil) or diesel fuel with the option to switch between the fuels at any time. This is to say that separate pipelines are installed for diesel and heavy oil, the latter being insulated and heated by thermal oil. The heating media of bitumen tanks, bitumen and fuel oil pipelines is thermal oil and a 1.000.000 kcal/h thermal oil heater is included in the system. SIGMA produces accurate and homogenous asphalt mixes with reduced energy consumption while meeting the European environmental standards. Furthermore, the tower structure comprises of modular levels at 20 ft container dimensions and all levels are completed at the factory including pneumatic and electrical connections. This important feature contributes to easier transport and quicker assembly of SIGMA asphalt plants.